If you are looking for career options and like working with your own hands, you should consider becoming a welder. It’s an absolutely exciting and rewarding career. Keep in mind that there are lots of welding certification schools in Virginia which means that you’ll be able to choose the one that meets your needs. In this article, there are some useful tips, facts and a list of the best welding schools in Virginia. To say the truth there are numerous reasons for becoming a welder and every one has its own reasons. Some individuals are interested in completing various challenges. Other like working with their own hands on open air and so on. Nevertheless, there are some reasons that are the same for most people. One of the main reason for becoming a welder in Virginia is an incredible outlook for welders. According to the U.S. Bureau of Labor Statistics, the number of job offers for welders grows constantly. The data shows that by 2026 the number of offers will grow by 6%. Keep in mind that there are some essential traits any welder should have. A median salary of a welder throughout the country is about $39 390 per year or $21.90 per hour. At the same time, the top 10% of welders throughout the USA earn about $62 100 annually. Speaking of Virginia, a median welder’s salary is $45 440 per year or $21.85 per hour, while the top 10% of welders earn about $62 550 annually. 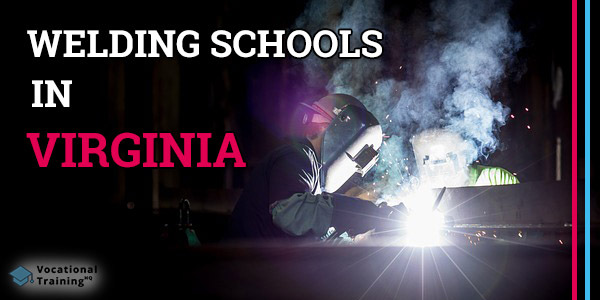 We’ve prepared for you the list of the best welding certification schools in Virginia. Each school from the list below was approved by the American Welding Society’s SENSE Accreditation Program. If you are thinking of becoming a welder in Virginia, you need to learn more about this career. It will allow you to get a better understanding of this profession and your future duties. Moreover, it will let you understand your classes faster. Welding is a process of joining metal pieces together using fire and heat. Of course, it sounds simple but still, it’s a difficult job. Welders create numerous projects that can be tiny or even enormous. If you want to become a welder, you should be strong both physically and mentally. Also, you need to be good at reading blueprints and instructions. Depending on project requirements, welders choose the most suitable welding methods and equipment. There are more than 100 of welding methods but most of them aren’t frequently used. In fact, there is a number of careers that are similar to welding. Nevertheless, soldering and brazing are the most similar options. Unlike brazing and soldering, welding doesn’t use any additional materials to connect metal pieces. Soldering and brazing require lower temperatures (below 850 degrees Fahrenheit/450 degrees Celsius). Both processes are based on the usage of the so-called fillers that are used to connect metal pieces. Considering the fact that brazing needs higher temperatures it allows producing stronger constructions. Now, as you’ve learned about welding, it’s easier to make a final decision. Just make sure you’ve learned properly all the available training programs before choosing one. We wish you luck and hope you’ll be able to start your successful career.